I have been holding off on starting this thread for a long time now (approx 6 months), mainly because it has been a very long drawn out process on trying to specify the build and become comfortable with the direction it was going. In addition to that, it has also taken a while to become confident that it was actually going to come together, as the last thing I wanted to do was start a big thread with a tall order and not finish. This build is based on TDImeisters "Recipe for the Insane.." thread, and Dave has done countless simulations on his software to refine the set-up and I am very grateful to be working with such brilliant Engineer that is so passionate about TDI's. There was a lot of discussion related to budget in that thread, and yes, even by scrapping pennies, this is a very expensive build. Please be patient with the pace of the thread and build. There are a lot of hold ups and such, plus my work is VERY demanding at this point. I have spent an average of 15-25hrs a week on this project for the last 4+ months and this demand will probably get worse, rather than better, and I will choose project work, prior to thread update. 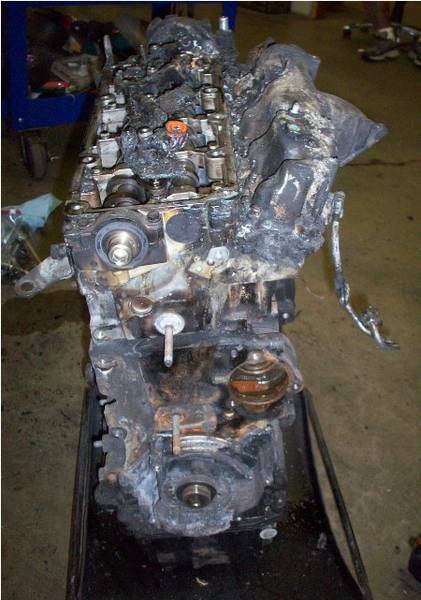 I am also hoping that the club members will be able to offer some additional advice, help, and resources on certain aspects of the build, as I would not define myself as an experienced TDI engine builder. 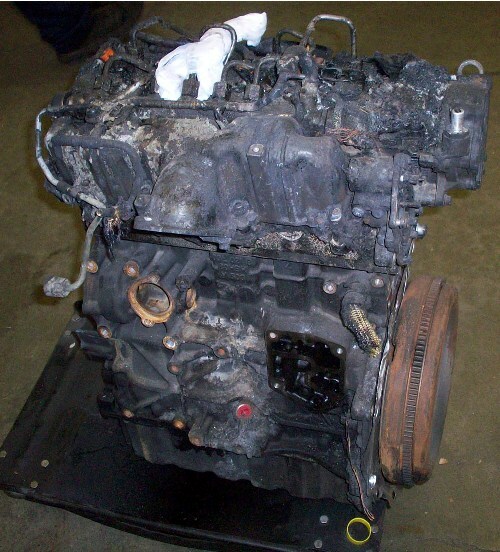 This is a pic of the engine when VWMike had picked it up for me from the wreckers yard in Washington. I had been watching car-part.com for a few months and grabbed this as soon as it showed up. I got it basically for the cost of the balance shaft assembly plus a bit more. The BS assembly (gear driven) will be going into my other Audi/BHW conversion. The CBEA block and crank face is pretty much identical to any other PD. I was initially a bit concerned about this when I was searching, but after some extensive cross checking on ETKA, my fears were more or less alleviated. Not all the detailed Information on this build will be shared until after the build is complete and there are some specific performance goals met both on the dyno and on the track. Once these have been established, remaining detailed information will be filled in on the thread, with exception to the injector/ECU control strategy (which will remain confidential to the tuners for their hard pro-bono work), and the turbo controller, which will be intellectual property of TDimeister and myself. I am going to get all the supporting vendors plugs right out front here, and update as the project evolves. I will keep the rest of the thread clean so it does not become tacky. Note - Vendors will be added to the list as there part of the project matures. This is one of the more recent sims I have from Dave. 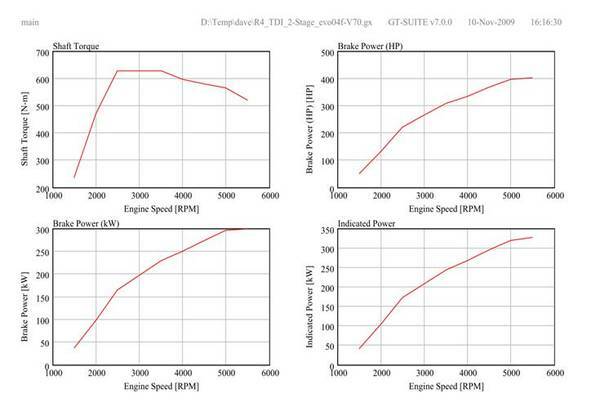 You can see that torque rises very quickly, even compared to a small single turbo. This is a result of optimization on turbo selection, and vanes position control and a few other tricks. You will also note we are clipping the torque at around 650n-m (480ft-lb). We are holding this torque flat from 2500 to 3500 rpm. If the cyclinder head breathes better than predicted, we may be able to hold this torque flat higher up in RPM. There are several good reasons to not allow torque to climb above this level. One is torque is directly related to BMEP & PCP. We are sitting about as high as one would want to reasonably go. For an R4 2.0litre engine, you simlpy can not get more torque without getting into a dangerous zone. Thats not to say it cant be tried, but why? 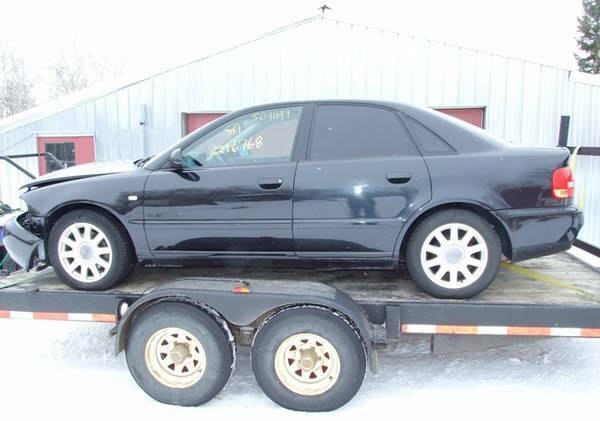 Even with my Audi configuration, 480ft-lbs is a lot of torque to put down. The other thing to note, is that this sim is based on lamba range of 1.2-1.3, and the BHP is shown to peak at around 405HP. This is a very clean smoke free HP! 450HP is reachable by adjusting the lamba down a little bit, and still in mainly smoke free power generation. This makes some of the big 6+ litre trucks putting down 400 smoke filled HP look pretty sad, that includes my own Cummins 5.9, which will get a custom VNT turbo when this project is done. Last edited by TDIsyncro; January 26th, 2010 at 11:28. I had an idea that you might be the one building this "recipe for insane engine build" and was going to pm you with a guess on that "something crazy, any guesses", that's awesome, I'm definitely subscribed . Can't wait for some pictures . If you need some injectors made after your own specs, feel free to contact me. Really curious what it will bring. Dave is a briljant engineer so you can skip a lot of trail and error. Are you going to run free programmable ECU or EDC? Lupo PD 280 hp & 500 Nm. Standalone systems are quite pricey so we were looking at EDC options. 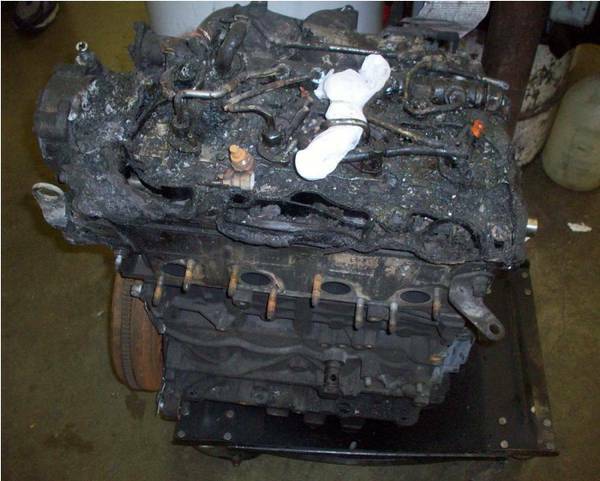 The stock ECU presents some rather large hurdles since EDC17 is relatively new. We haven't exactly been able to confirm the existence of any EDC15/16 ECU with piezo injectors either. EDC17 will be so much work for this project. My choice would be a EDC16C of a BMW 335D. Commonrail piezo injectors and lots of maps you can use for wastegates and bypass stuff of the compound. Or a Nira, those are so great! But like you said really expencive.. This has been suggested to me, but I haven't been able to find much info on it. Do you have an original file for this ecu? Please pm me your mail adres. I have some stock injectors here to i you want to know anything about it. I think i can get you a ecu if you want. I've done a 330D E90 a while ago with bigger piezo injectors, bigger ic, dpf remove and sw. It made 330 hp and 800 Nm. The engine will be very nicely "pickled" for your use. I'm very excited about the project because it brings this kind of power levels to a streetable package. 15 Golf SW DSG, 00Jetta 6spd race, 99.5Jetta Rocket ARL-PD150 6spd 2260, 2003.5 5.9L Cummins QCLB 4x4 Blue Monster, 00Passat1.8T, other tdi's: 97J, 98J, 99.5J2x, 00-C5 6spd - EFILive, HPTuner, Diablo Sport! Never argue with an idiot.They will just bring you down to their level and beat you with experience. The beatings will continue until the morale improves! Good judgement comes from experience, and experience comes from bad judgement ! lol Yes. It is very fortunate that the heat was just enough to burn the plastics and non of the metals had damage or evidence of getting to warm. I will have split out the latest torque/HP diagrams you sent me for one of the place holders above. It's a very good point Dave. It is very impressive to see the level of torque coming on at such a low RPM, and the boost/fuel/torque is controlled to limit PCP to a max safe level. There really is NO lag. The high rail pressures available (and variable rail pressure) also give us some good flexability in nozzle sizing for attaining max HP in a clean injection window, yet should be able to maintain decent low power control. There are probaly a few other diagrams that would be nice share.